Last year on New Year's Day I stayed home while John went on bike ride with a big group. When I saw the photos he took I had hoped that I would be 'seasoned enough' to join in on the next ride -- and you bet your bottoms I did not stay home this year! Similar to the prior year all riders who wanted to participate gathered at the Starbucks on Green Valley Parkway to which John and I rode our bikes from home. He and I were bundled up in layers of clothing to keep us warm in the mid-30 degree temperatures (yes it does get this cold in Las Vegas). 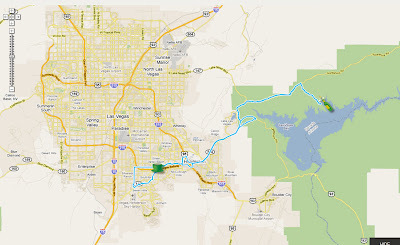 After we savored a hot cup of freshly brewed coffee and warm pastries at Starbucks, we (along with about 30 others) started our ride west towards Lake Mead to the Callville Bay Resort & Marina. I didn't take a whole lot of photos along the way; it was difficult to do with gloved hands. My phone was buried in the pocket of my long sleeved jersey which I wore underneath my jacket. Riding in freezing temperatures made it difficult to pedal or even have conversations as my lips moved like molasses to form words. Still I enjoyed riding with our group. After I had ridden 38 miles, the marina was in sight where we stopped to use the restroom, fill up our water bottles, and eat our snack bars. Now was my chance to take some photos! This was our turnaround point where we headed back up Callville Bay Road, Northshore Drive out of Lake Mead National Recreation Area, along Lake Mead Parkway, down Wigwam, and side streets to Starbucks. By this time it was after 1:30 p.m. so John and I stopped to eat lunch with a few others before getting back on our bikes to ride home. 4 hours and 11 minutes of pedaling, I logged 74.50 miles -- the farthest I have ridden in one trip! I think this year is already off to a good start and look forward to the days to come in 2011. Wowwwww, what a beautiful ride Daly! That landscape is soooo awesome! 75 miles in just over 4 hours is awesome! In terms of cold temps, way to perservere. Good thing it wasn't cloudy or rainy. @Enrique: thank you :-) It is pretty scenery. @Dano: thank you. Our group was riding an endurance pace so everyone can stay together. I'm glad it wasn't cloudy or rainy either--that would not be fun in the cold.